Please tell me you're not still using plastic or paper bags when you go shopping. Puh-lease! 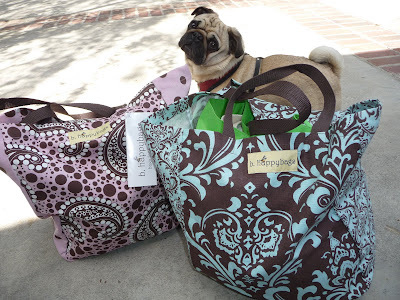 It's so easy nowadays to find good, sturdy, cheap, and good-looking reuseable bags. And it's so much better for the environment. Here's Mu Shu, above, providing a sense of scale as you gaze upon the wonderfulness of a canvas bag from my local grocer. Easy to find (practically every grocery store chain sells canvas bags now), it's not very good-looking, perhaps. If you don't want your local supermarket logo emblazoned on your bags, how about showing your support for your alma mater? Below, Mu Shu sends up a cheer for Pomona College. 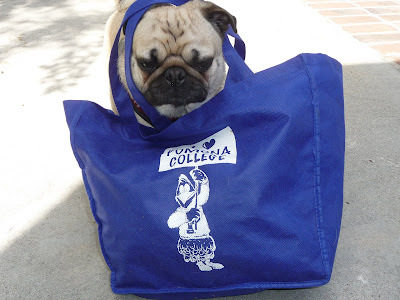 He'd like you to know practically every college campus bookstore also sells reusable bags, so you can show your school spirit wherever you go. Go, Sagehens! 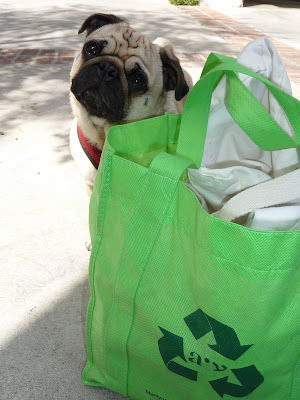 Sometimes an Earth-friendly shopping bag will just fall into your lap, like this one. My family received it recently. Instead of using wrapping paper, the giver sent us goodies in this bag--a very thoughtful gesture and a gentle reminder to be kind to our planet. This bag, below, is nifty. I got it from my local grocery store, in the liquor aisle. Buy any six bottles of wine or spirits, and you get a 10% discount on the total, plus this divided bag to carry them home. It's smaller than the average cloth grocery bag. In addition to toting booze, it's perfect for safely transporting home those chi-chi glass bottles of fizzy lemonade or olive oil or balsamic vinegar. "Americans use approximately 14 billion plastic bags each year. That's about 425 bags per person! 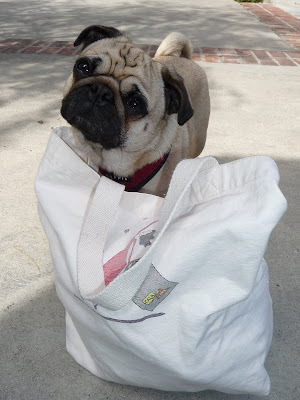 Only 1-3% is recycled....In New York City, one less plastic bag per person annually would reduce waste by 5 million pounds!...In one year 14 million trees are cut to produce the 10 billion paper bags used by Americans." That's unforgiveable! Let's make it a trend, people. Whether you get your cloth bags from a friend, buy them on the cheap at the supermarket, or spend a little more for some serious style, become a Bag Person! A few tips on getting into the bag habit: If you have trouble remembering to take reusable bags with you when you shop, put your keys or wallet on top of them. If you can remember to take them out the door, store them in your car. If you find you leave them in your car as you head into the mall or grocery store, put your purse or wallet with the bags. Or stick them on your lap. Or sit on them. 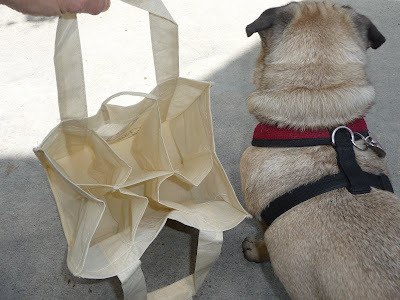 If you have no space for canvas bags in your life, there are itty-bitty folding-up ones of nonrippable nylon that stuff into a tiny stuff sac that you can stick in your purse or coat pocket or leave in the top drawer of your desk at work. Do it for the planet! Mu Shu is a lovely bag model.